Myself and Crows Nest Officer's Club Chair, Margaret Morris, pose with a photograph of the Thetis, in front of the ship's wheel hanging in the Club. In 1881, the newly built SS Thetis sailed from the shipyard of Alexander Stephen and Sons in Dundee, Scotland. The new whaler had been named for the Greek sea goddess, said to keep the seas calm and tranquil for sailors. An ornate figurehead of the goddess herself, serenely gazing upwards, was mounted to her bow. Thetis was a rugged vessel built to withstand the icy conditions of the North Atlantic using her steam engines. Her first operators, the Dundee Whaling Co., with supplies from William Stephens and Co., operated her out of St. John’s from 1881-1883. An active participant in the seal fishery, she made 6 trips to the ice and brought back 42,734 seal pelts. Her reputation began to develop as that of an excellent boat for conquering the ice. As she was in service off the coast of Newfoundland, another event was unfolding in the North. 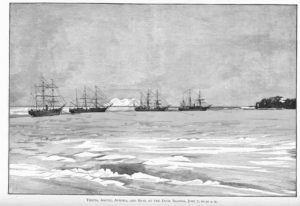 To mark “International Polar Year” in 1881, the United States had sent Lt. Aldolphus Greely on an expedition to Lady Franklin Bay in the Canadian Arctic. His mission was to establish a weather station, to acquire astronomical data, and to acquire additional data about the magnetic pole. However, Lt. Greely also hoped to push the furthest North than anyone had to that point. He succeeded, but at a grave cost. The Thetis and other ships, at sail during the recovery mission. 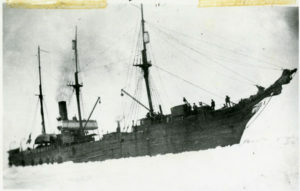 Due to the ice conditions, supply ships coming up from St. John’s were unable to reach the expedition. Then, in 1883, the expeditions relief ship, the Proteus, was trapped in the ice and eventually crushed and sank. The USS Yantic was sent to try and rescue the explorers, but was again deterred by ice and stormy conditions. The expedition was left with what little supplies they had, and each other. They were stuck. When news of the tragedy reached home, the US and British Navies immediately set about sending ships to rescue the stranded group. The SS Alert, SS Bear, and her sister the SS Thetis were among those ships scrambled to the arctic. The Thetis had been purchased from her owners specifically for this mission, since only those ships designed to make their way through the ice could offer any hope of finding the survivors. Commander Schley, who headed the rescue, named the Thetis as the flagship for the mission. 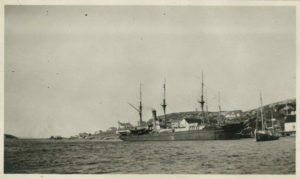 The Greely Relief Expedition departed from the Navy Yard in New York City in late April 1884 and arrived in St. John’s in May, with the Thetis leading the way through the Narrows. Her hull had been painted black, causing her to look very imposing as she came alongside in the harbour. Newspapers reported a flurry of activity along her decks, as a spare rudder was been secured to the top of her wheelhouse, and skiffs, sleds, boxes and barrels were piled on her forecastle. Once all the vessels had received their supplies, they set out for the North. Upon reaching the ice, the Thetis set about ramming and bashing a path through towards the last known location of the expedition. Despite rough ice conditions and storms, after a month the Thetis discovered the last 7 survivors of the 26-man expedition, including Greely himself. Upon examination by their on-board doctor, it was discovered that had the Thetis taken one more day, the entire crew would have been lost. The Thetis uring her glory days. The Relief Expedition arrived quietly through the Narrows in early July, much to the surprise of the local population. It had been thought when they had sailed off that there would be no word until, at the earliest, September. As news spread of the tragic loss of most of the Greely crew, Lt. Greely and Commander Schely were debriefed and gave interviews to local media. The ships then sailed for the United States, where they were met with much celebration and fanfare. Following the rescue of the Greely Expedition survivors, the US Navy sold off most of the ships that had been involved in the mission. The Thetis was exempt from this, thanks to a letter from the Secretary of the Navy. Instead, she was decommissioned and returned to the Navy Yard in New York. This didn’t last for very long, and in 1887 the Thetis found herself in service again, this time on the Pacific Coast. For the next few years, the ship sailed out of San Francisco and Honolulu. She was outfitted as a gunship and put to work along the coasts, sailing from Central America to Alaska and back again. She surveyed the coasts, carried out analysis’ of proposed cable routes between California and Hawaii, and her rugged hull and easy maneuverability meant she could face almost any sea conditions and emerge virtually unscathed. This trait didn’t go unnoticed, and in 1899 she was selected by the US Revenue Cutter Service (precursor to the Coast Guard) as the new ship for a truly unique mission – transporting reindeer. During the late 1800s, a visit along the coast of Alaska by American officials revealed a shocking situation. Some of the communities had been struck by starvation during the winter, due to over hunting in their areas. The American officials came up with what they felt was a brilliant solution – transporting Asiatic reindeer from Siberia to Alaska. The small herds would be brought ashore to certain communities, and the members of those communities would be taught how to herd and care for the reindeer. That way they could barter and have a constant source of food. Thetis’ sister ship, the Bear, had been assigned to the first trip, as she was already in the Bering Sea, but years of abuse by the seas in the North had not been kind to the ship, and she was looking a little worse for wear. The Thetis, on the other hand, had spent much of her more recent years in the noticeably calmer seas of the south, and so she was in much better shape. She made for port in San Francisco, where she was fitted out for the Arctic cruise, and then she set sail. Stopping briefly in Seattle to pick up bartering materials, the Thetis sailed up into the Bering Sea and then over to Siberia. Her crew set about their regular duties, as well as designing pens, troughs, and hobbles for their unique cargo. Once they arrived, an officer went ashore and negotiated with the local community. After the terms were agreed upon, the reindeer were wrestled, herded and hobbled, and brought on board the ship via her small boats. Once they arrived in Alaska, the reindeer were moved from their stalls to the small boats, and lowered over the side of the ship before they were rowed ashore to the local community. Through the summer of 1899, the Thetis made 6 trips to Siberia for reindeer, successfully delivering each load to Alaska. She operated so well on the unpredictable Bering Sea, that the Revenue Cutter Service started to push for the permanent acquisition of her to their fleet. In 1900, she was put in for repairs and a full refit, and was soon sailing under the Coast Guard’s colours as part of the Bering Sea Patrol. During the spring and summer months, the Thetis sailed with the rest of the Sea Patrol, monitoring the Bering Sea fisheries, sealing grounds, and performing search and rescue missions. One of her commanders noted that when it came to “working in the ice, the Thetis [h]as no superior afloat”. The storms and seas of the Bering Sea could be particularly rough, and many times the Thetis suffered damage, such as in 1912 when during a particularly brutal storm she lost, among other things, most of her foremast, her rigging and gear from her spars, her jibboom and part of her radio antennae. This didn’t stop the ship, and she always came out the other side of even the worst weather. Her Alaskan travels didn’t only involve sea patrol, however. Because of her maneuverability and skills in the ice, the Thetis was also used by the Coast Guard to shuttle officials up and down the Alaskan coast, from Unalaska to Nome and back. She transported officers to conduct marriages, judges and stenographers to conduct court cases, and prisoners and convicts who were being held. She truly was a versatile vessel. In the winter, when the ice was too thick for even the Thetis to navigate, she headed back to her warm southern waters. Here, she was used primarily as a customs protection vessel, sailing and intercepting ships suspected of illegal fishing, poaching, and smuggling, as well as assisting vessels that were in danger, or crews that had been shipwrecked. All good things must come to an end, however, and in 1916 the US Coast Guard decided that the Thetis had outlived her usefulness, and would be too expensive to repair. She was sold to the merchants Job Bros. & Co of New York, and sailed back to the East Coast via the Panama Canal. Job Bros. completely renovated the ship upon purchase, outfitting her with new equipment before assigning her to her new post. They had a dock in St. John’s, and so the Thetis found herself sailing back to the waters of the North Atlantic, to work as a sealer and general trade vessel. From 1917 to 1936, the Thetis made 19 trips to the ice and acquired 246,814 seal pelts. She was frequently billed in the newspaper as a season high-liner, able to secure between 16,000-24,000 pelts per season. When she wasn’t at work in the ice fields, the Thetis sailed up and down the shores of Labrador, or down to New York, bringing supplies, mail, and other freight to and from the communities. In 1919, she underwent another refit that saw her engine room completely redone and painted, and new equipment installed. She became one of the only ships in the local fleet to have her own electricity system, and ship wide heating. Her new evaporator could make 14 tonnes of fresh water in 24 hours, and her modern Marconi wireless meant she could be in constant communication with others of the fleet. The “staunchness of the good old ship” was commented on frequently, as she made it through storm after storm, sustaining damage but never going under, and always coming back with plenty of pelts and fat, or with her cargo intact. In 1922, she came through the Narrows with 17,000 seals on board, and her bow heavily damaged from a storm. The only reason the ship had come in was because the at-sea repairs didn’t seem to have worked, and she had to offload some of her catch so that the area that had been damaged could be accessed. Immediately after the repairs were completed, she was off to the fields again. Even her crew seemed to have some of the ships luck; in 1923, a squall blew up on the ship and managed to send the topmast, the lookout barrel, and the lookout crashing to the deck. The crew rushed over, expecting to find their shipmate dead. Imagine their surprise when they found him completely fine, save for a sprained wrist and very shaken up. A piece of the wreck, on the shores of Freshwater Bay. Unfortunately, as time went on, vessels that were faster and easier to upkeep became available, and the Thetis began to show her age. In March 1936, she sustained heavy damaged to her hull in the ice, and returned to St. John’s to offload her last catch. Job Bros. decided to retire the ship for good. Her figurehead and fittings were removed, and the wood of her hull was given away to the public for firewood. The demand for wood at the time was so great, that the police had to be called to calm the riot that resulted. Her hulk was towed out to Freshwater Bay and grounded, where she stayed until she broke up. 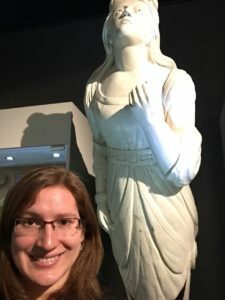 The Thetis’ figurehead now resides on the fourth floor of The Rooms Provincial Museum, tucked in the back of the main gallery. She stares up at the ceiling now, rather than the stars of the Alaskan, Hawaiian, or Atlantic night skies, but you can still appreciate all the miles of ocean she has seen as you stand before her. While some may argue that a ship with such a checkered past should have gone out in a blaze of glory – taken by a storm or fire, for instance – I disagree. I think she lived a long life, keeping her crews safe and always coming back to port, and that she was let to rest peacefully on the shores of Freshwater Bay, well, I can’t think of a more fitting end for such a resilient vessel.